Here at CMoG we are always doing our best to inform our guests about the intricacies of our favorite material, glass. 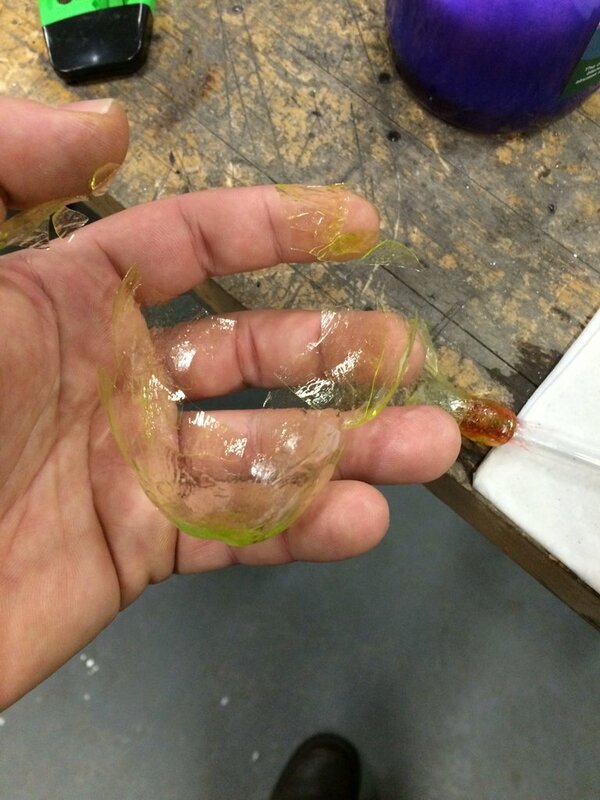 It can be difficult to connect this message with some of our guests because glass and the processes for working with glass are mysterious to most people. 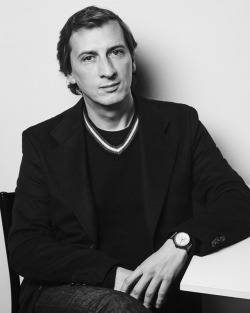 If we can relate the material and the working processes to other materials with which people have greater familiarity, the learning curve goes much faster. Most, if not all, of our guests can relate to candy, of course. Well…many candies have some important similarities to glass. 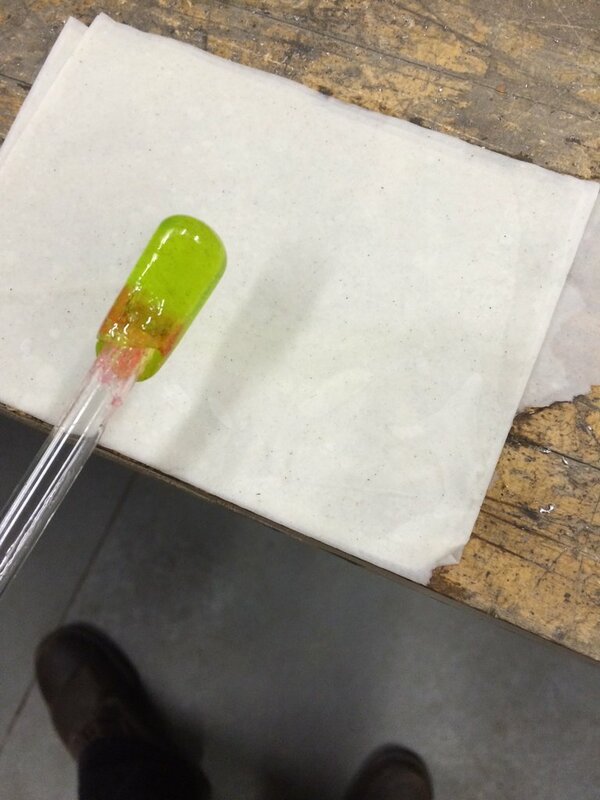 Our Curator of Science and Technology, Dr. Marvin Bolt, had the opportunity to visit with some colleagues at Lehigh University in Pennsylvania who were pursuing the similarities between hard candy and glass. Their pursuit was to use the candy instead of glass to build low-cost models for glass manufacturing processes. 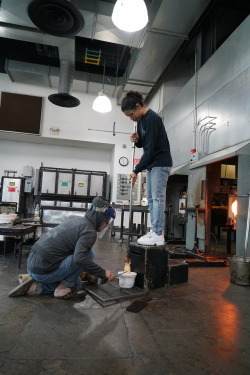 Dr. Bolt saw a wonderful opportunity for us to use candy-glass as a bridge to teach our guests about glass, and our Education and Demonstration Departments have been hard at work implementing these concepts. I was first brought into this equation to test the possibilities of using candy-glass for demonstration purposes as part of our Winter Break activities. Our Director of Education, Kris Wetterlund, stopped by my office with a big bag of Jolly Ranchers candies and the request that I play with them to see what might be possible. The initial candy-glass studio with candle, glass tube, and candy. I jumped right into action and ate a couple of the candies. Then, I pondered the possibilities. 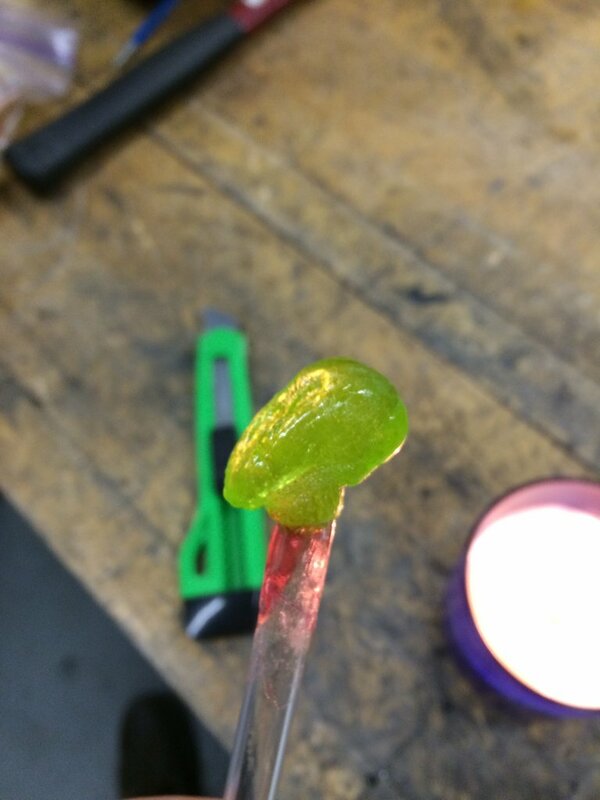 Having been told that the candies could be softened with very low temperatures (relative to glass), I grabbed a candle and started experimenting in one of our workshop spaces. but putting in real details wasn’t working well. The heat of the candle was a bit too much for the candy. It was usable, but the candy tended to get so hot on the surface that it was boiling and bubbling. I did continue to play with it a bit though. I do quite a bit of sculptural and blown flameworking, and the first thing I tried was to sculpt a human head. What I found was that the candy stayed soft for a very long period of time, and this actually made it somewhat difficult to sculpt by hand. In glass, we talk about the material having a “working range.” That is, glass does not go directly from being rigid to dripping immediately like most metals or plastics will. Glass goes through a range of getting softer and softer as it gets hotter, and it continues to get stiffer as it cools and eventually hardens. The candy was reacting in just the same way, but it was staying soft for a much longer time than any glass with which I had ever played. It was hard to maintain the facial details I was pursuing because the candy was too soft to hold each detail as I created the next one. I’d try to carve in the eyes, but as I added the nose, the eyes would shift. A wet paper towel worked quite well for marvering or shaping the candy uniformly before inflating. It was also tricky to keep my fingers or my exacto blade from sticking to the candy. Hot glass will only stick to other things that are extremely hot. Hot candy sticks to anything that is not wet. However, there are definite similarities in the softening point and working ranges of both glass and these candies. Both materials will break in a similar fashion as well. Yep… It breaks into shards that are very sticky. 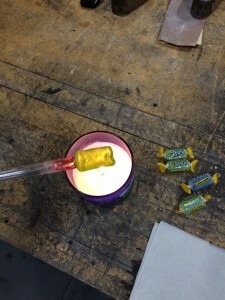 The next thing I wanted to try was to inflate the candy just as I would with a gather of molten glass from a furnace. So, I heated another candy and stuck it to the end of a small glass tube. Once the candy was evenly heated throughout, I was actually able to inflate it somewhat accurately. From the perspective of this glassmaker, these materials are very similar. The next step was to hone in on the right heat source for this process. The candle was too hot, but my next choice for a heat source, a hair-dryer, was not quite hot enough. I found the ideal tool to be a paint-stripping heat gun. On its lowest setting, it provided the perfect temperature and air-flow. With all this figured out, it was time to take the process to the people. 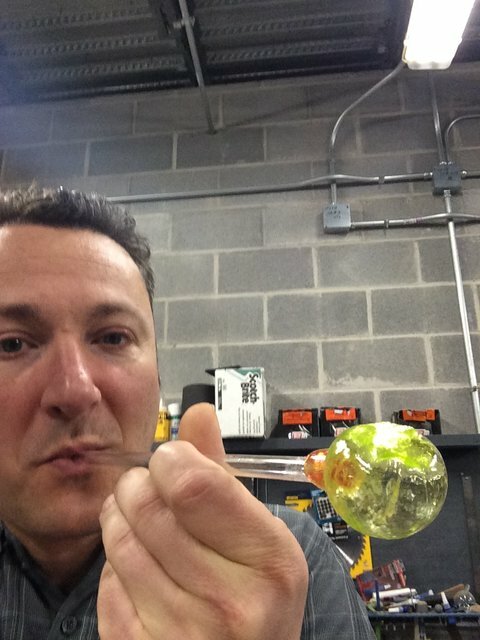 For a few of our Flameworking Demos during Winter Break, we added in some candy-blowing. 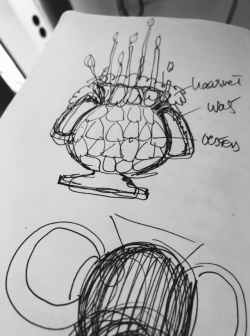 It really seemed to connect with the audiences, and we can see many new potential uses for candy-glass as a teaching tool moving forward. We will be exploring this more during our Spring Break offerings as well. Hopefully, you can come visit us and grow your understanding of the mysteries of glassworking with one of our candy-glass demos. The all-important heat gun…supported by a couple of 2-part blow molds. Gathering from a pool of molten candy didn’t work well as the viscosity just was not effective. Either too soft…or too stiff/sticky..